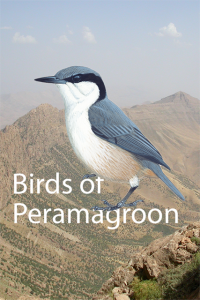 This week saw the approval of the Birds of Peramagroon identification app in the Apple iTunes app store. It had been approved for the Google Live Android app store several weeks ago. Being available in both app stores means it is now accessible to most smart phone users and we can finally consider it live! Two questions probably spring to your mind. Where is Peramagroon? Why has a botanic garden produced an identification guide for birds? Peramagroon is a mountain in Northern Iraq and forms part of the Zagros Mountain range. The area has a high level of plant biodiversity with mountain riverine forests, oak woodlands and thorn-cushion vegetation. This supports a high diversity of bird life. The Centre for Middle Eastern Plants (part of RBGE) has been working on a multi-agency project in the area and, as part of that project, needed to empower people to identify the birds as per the standard textbook for the area – Birds of the Middle East. We already had a experimental mobile identification system that had been used on several plant groups as adjuncts to MSc theses. This birds project offered an opportunity to take that software to the next level and release a guide to the public. The advantage of going with the birds for our first guide is that the data is already complete and tested. We were generously given permission by the publishers Bloomsbury and the illustrators of Birds of the Middle East to use their illustrations. Sophie Neale (CMEP) worked with the projects bird team including Richard Porter (one of the authors) to develop and compile a character matrix and populate the app with images. I could concentrate on getting the software working properly. Please try the app and let me know what you think. Either click the appropriate link below or search for “peramagroon” in the app store on your device. The notion behind the app is to take the simplest possible approach to identification. The Keep It Simple Stupid approach. In fact the app doesn’t actually allow identification in the strict sense it simply permits ordering of species by how well they match a user specified filter. There is no ruling in or out of species as might happen with a traditional dichotomous key or many on-line tools. It is up to the user to make a decision based on the ordering presented. This is how many people “work” a dichotomous key – moving backwards and forwards along the different leads until they are happy. It was felt this approach best suited the small form factor and user affordance offered by mobile phones. Species are the taxonomic units to be identified. Each species has a title, subtitle, text description (not used for this app) and a number of images. Character Sets are organisational units to simplify the interface. In plants they may be something like “Fruit” or “Leaves”. 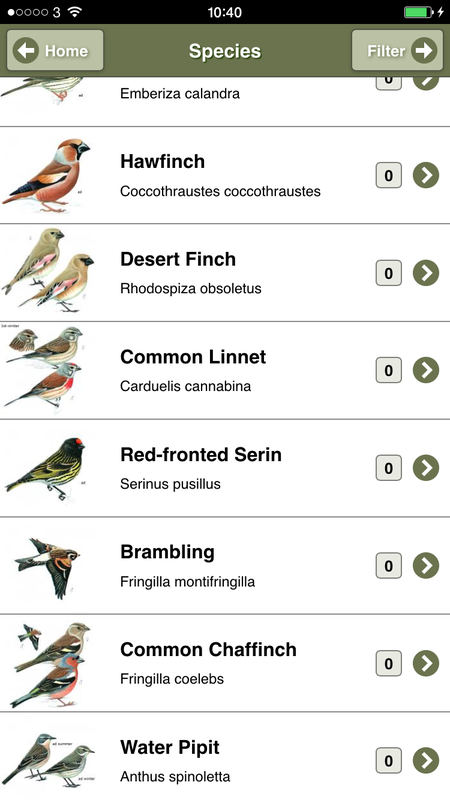 Two are used in the birds app; “Context” and “Characteristics”. The user perceives them simply as subheadings. Characters are descriptors that may be present in one or more states. 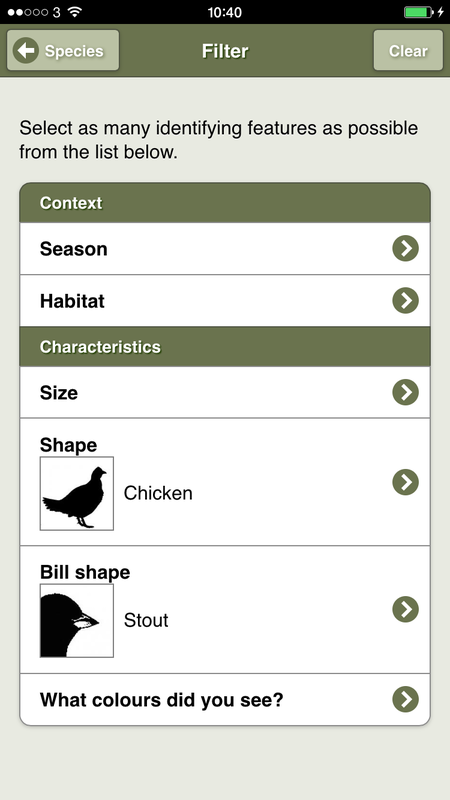 An example from the birds app is Characteristics > Shape. Each character belongs to a single character set and may have multiple character states. Character States are the possible values for the characters. An example from the birds app is Characteristics > Shape > Dove. Each character state belongs to a single character. Character states may have associated images. Scores are the link between species and character states. Each species is scored to numerous character states. In the birds app Little Ringed Plover is scored to the character state Characteristics > Shape > Dove. Scores are not apparent to the user. They govern which states are displayed on the species profile screen and how the species are ordered when a filter is set. Species can be scored to multiple character states for a character. Following the terminology used in the DELTA format all characters are unordered multi-state. There are six screens in the app. Home – Basic information about the application. About – Credits and contact details. Species – A scrollable list of all the species showing the first image, title and subtitle. Initially this is ordered naturally. It is suggested that the more common species should be presented first. If a filter is active then the order changes so that those species with states matching the filter come first. The number of matching states is shown as the score. Tapping on a species in the list displays the profile for that species. A button on the top right goes to the filter screen. Species Profile – All the data about this species in the app: Title, subtitle, text description, images (tap to enlarge) and character states organised by character set and character. Filter – A list of the characters organised by character set. Tapping a character displays the score screen. A button on the top left allows the filter to be cleared. Score – Select which states are present in the observed specimen. Multiple states can be selected. Martin Gardner of the Conifer Conservation Project here at RBGE is working on the top fifty or so conifers found in Scotland and that should make a compelling app. We are looking to have this released by October 2015. Do you have data on a group of plants that would benefit from this approach? If so maybe we could work together. The project is funded by the UK Government’s Darwin Initiative programme. To find out more about the project see www.iraqdarwin.org.